Something violent is going on the night sky, right now. And scientists studying the phenomenon said yesterday that with a pair good binoculars or a telescope you can see a star in its final throes causing a spectacular explosion called a supernova. Even though the star is 21 million light years away from Earth, the explosion is the closest and brightest astronomers have found in decades. Today will be its brightest night. The discovery, announced on Wednesday, was made in what was believed to be the first hours of the rare cosmic explosion using a special telescope at the Palomar Observatory near San Diego and powerful supercomputers at a government laboratory in Berkeley. The detection so early of a supernova so near has created a worldwide stir among astronomers, who are clamoring to observe it with every telescope at their disposal, including the giant Hubble Space Telescope. 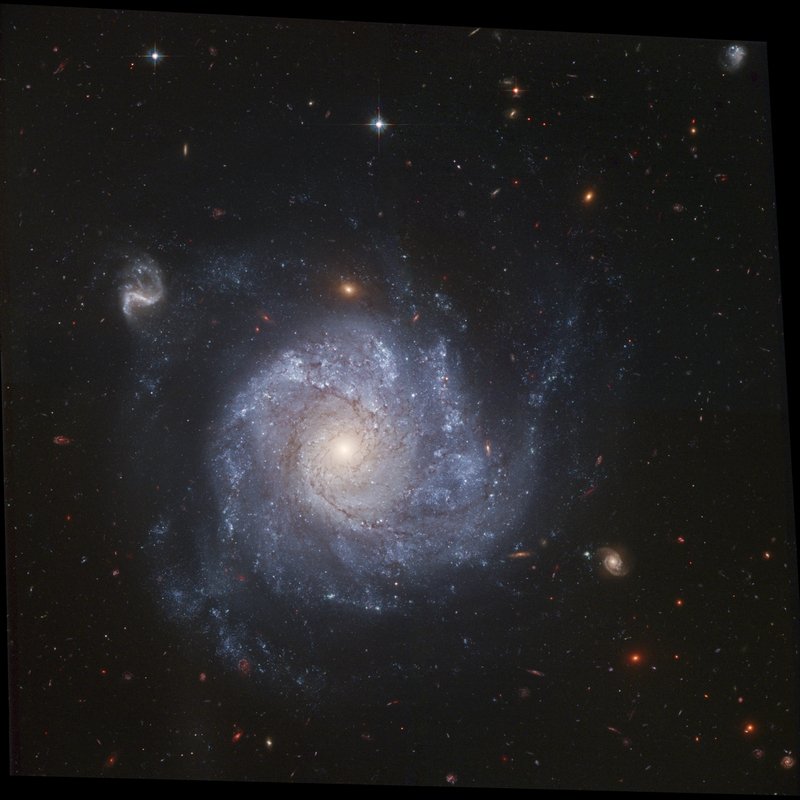 The star is located in the Pinwheel Galaxy, and you can spot it, weather permitting, above the Big Dipper. USA Today says the best time to catch it is just after sunset, before the moon brightens the sky. I think it's time to break out the 6" refractor, the spotting scope, and my binoculars to get a look at this thing. It won't be a spectacular-looking thing, but if you can appreciate seeing a point of light from a dying star 21 million light years away, it'll be worth your time. What is an analemma? APOD has the answer with a link to a movie. I thought this was a painting at first. There was no way that image existed outside of a human mind. I was wrong. Update: I just clicked on the big picture. There's a little point of light between the moon and the clouds. It looks like there is a vapor trail or something trailing behind the point. A rocket? 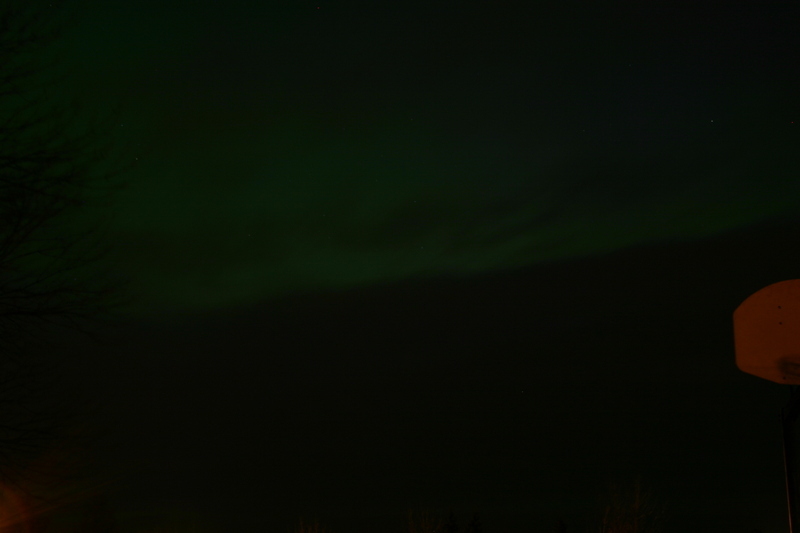 As promised earlier, here are a couple of pictures of the Northern Lights taken from my front yard on December 14th. The clouds moved in and stayed around for the next couple of days, so these are the best shots I could get. Solar activity has been low for the past two days, so these may be it for a bit. 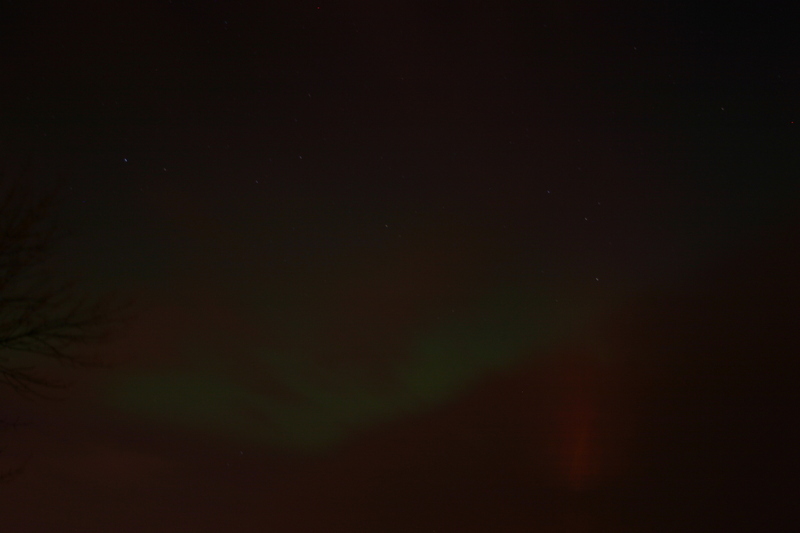 I saw the northern lights this evening. 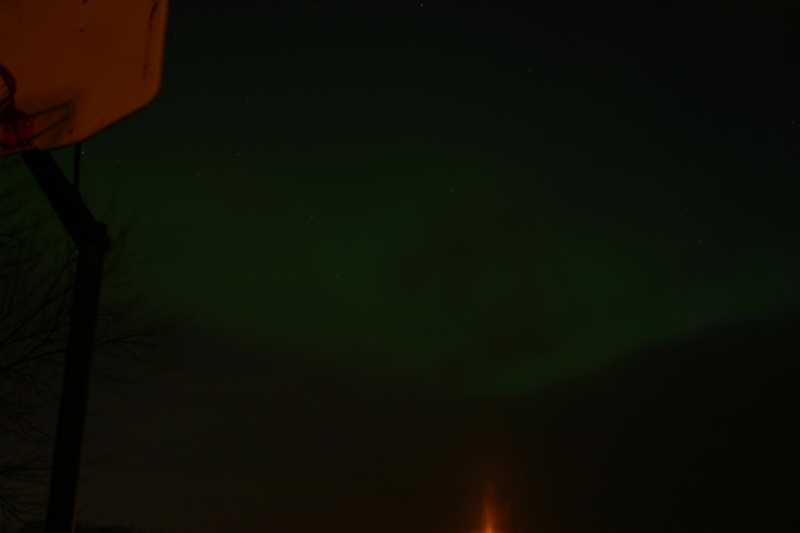 A friend from Sioux City called and said he could see them down there very clearly. I got a few pictures of what I saw here. I'll upload them sometime in the next few days. Right now it's cloudy. Hopefully the dadgummed clouds will go away and play with someone else. Astronomers have apparently found another cloud of gas - this one made of methyl alcohol. 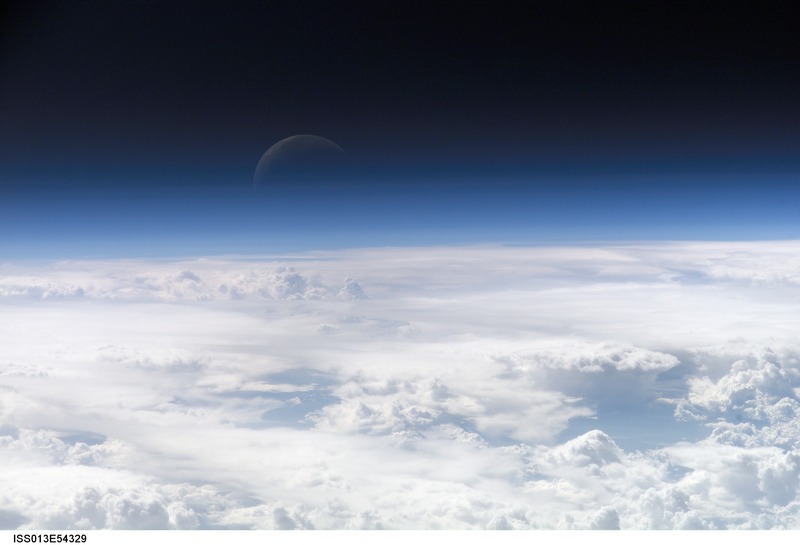 Is there life outside of earth? By looking at pictures such as these, it's getting increasingly harder to think otherwise. Some astronomers have picked candidate stars that they believe most likely harbor life. US astronomers have come up with a short list of five stars in the Milky Way galaxy that are most likely to support extraterrestrial life. But they have narrowed their choices to stars that likely harbor life as we know it. The stars were chosen based on a number of criteria, including size, composition, age and color, that would make them similar to the sun and enable planets resembling Earth to orbit them, said Margaret Turnbull of the Carnegie Institution of Washington. Of course, there may be other forms of life out there that do not resemble anything like that with which we are familiar, meaning that most stars could harbor some form of life. But one can hardly blame astronomers for narrowing their choices by only looking at sun-like stars. APOD does it again with this beautiful picture of a face-on spiral galaxy. In another Nature paper about the Kuiper Belt published this week, Frank Bertoldi (University of Bonn, Germany) and four colleagues report thermal observations taken with the Institute for Millimeter Radio Astronomy's 30-meter telescope in Spain that confirm that the distant object 2003 UB313 is indeed larger than Pluto. By comparing UB313's brightness and reflectivity, Bertoldi and his colleagues measure a diameter of about 3,000 km, which is 700 km larger than Pluto's. These results are consistent with previous Spitzer Space Telescope observations of this so-called "tenth planet" that were announced four months ago. "Since UB313 is decidedly larger than Pluto," says Bertoldi, "it is now increasingly hard to justify calling Pluto a planet if UB313 is not also given this status." I've recently been introducing Powerkid, The Eldest to the heavens. We've spoken some about the planets and he thinks there are 9 or 10. That's one good thing about kids... they aren't always set in their beliefs :-). Here and here are a couple of other previous posts on the new planet/kuiper belt object/giant ice globe.